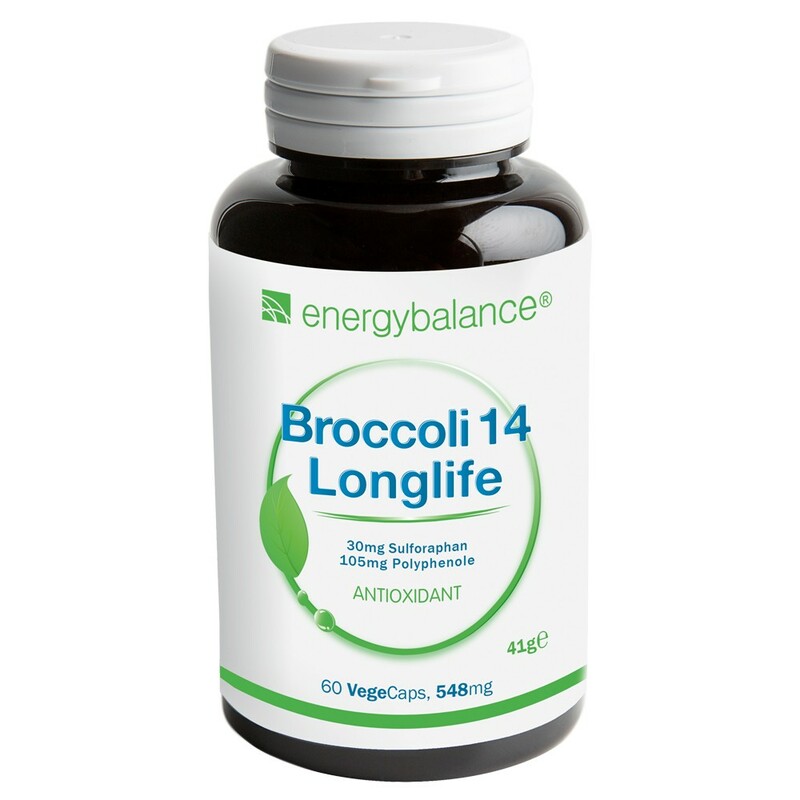 EnergyBalance™ Broccoli 14 Longlife combines two powerful ingredients in one capsule for a greater cell protection. One part is a standardized amount of sulforaphane. It's the most highly concentrated extract on the market. Two capsules contains 30mg of sulforaphane, this is equivalent of a huge portion of 750g of broccoli. In addition you get an important portion of polyphenols coming from organic pomegranate (Punica granatum) juice powder, pomegranate seed and pomegranate peel extracts. Pomegranates polyphenols are also known as phytochemicals. These powerful phytochemicals give pomegranates their unique aroma and effect. One 548mg capsule contains 105mg of polyphenols. Contents: 60 vegecaps à 548mg = 41g. Vegetables belonging to the cruciferous family like broccoli are associated with antioxidant and cell-protecting qualities. EnergyBalance Broccoli 14 Longlife contains a standardized concentration of sulforaphane glucosinolate extract from broccoli seeds. The body metabolizes sulforaphane glucosinolate, turning it into sulforaphane (iIsothiocyanate), a highly active antioxidant. Extensive studies show that sulforaphane strengthens the activity of detoxifying phase 2 enzymes and protect DNA. Tropaeolum commonly known as nasturtium is a genus of roughly 80 species of annual and perennial herbaceous flowering plants. You can read the study about Tropaeolum. Other interesting information you can find on this link here. 60 VegeCaps containing 548mg = 41g.